Photo of the Month — Food What?! The Photo-of-the-Month shares a moment, highlight, or story to offer connection to the experiences at "Food, What?!" Sign Up to Receive FoodWhat's Photo-of-the-Month below! Farm and Culinary Manager David Antonio Robles is a farmer, activist, and artist who loves to use his skills to cultivate community and resilience among youth. As the grandchild of migrant farmworkers, David's farming roots run deep. He recognizes the power that food has to connect the individual to their culture, their community, and their environment and hopes to guide young people through that process. 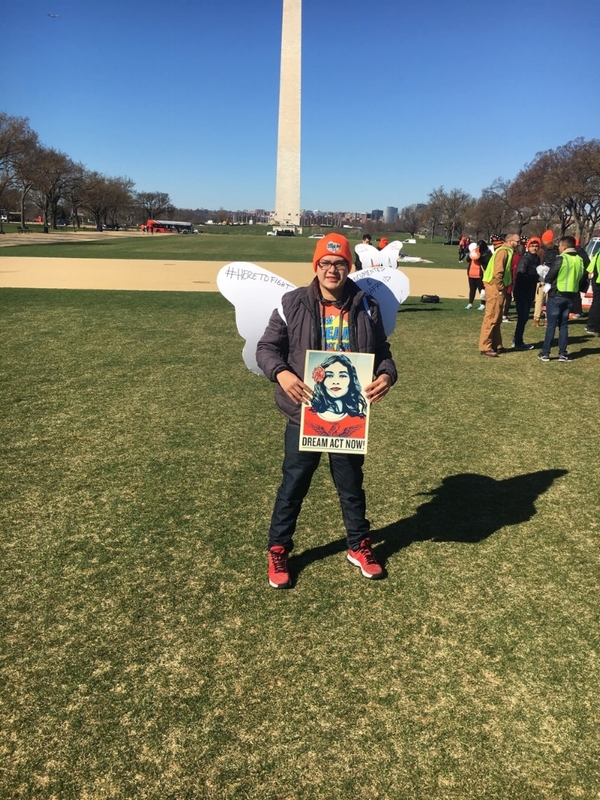 During his time as an undergrad, David started working for the Center for Agroecology and Sustainable Food Systems (CASFS) where he began to understand the responsibilities of land stewardship and its connection with the health and resilience of his community. David comes to FoodWhat from the CASFS Apprenticeship in Ecological Horticulture as a 2nd year in the Farm Garden. He attended UCSC where he earned his Bachelor's Degree in History with a concentration on Social Movements in the Americas. Programs Manager Lupita Sanchez joins our team as a local community activist, trauma-informed youth advocate and mentor dedicated to radical education. Born and raised in Watsonville, Lupita has 8+ years working closely with community organizers. She has a deep and personal connection to those she serves. Lupita’s capacity to create and inspire change lends itself well to this work (so does her contagious laughter). Her background as a high school Ethnic Studies teacher, certified counselor for youth survivors, and community organizer informs her ability to support youth in a unique way. She has a passion for applied theater, grassroots organizing and transforming communities through youth leadership, creativity, and collective action. She holds a BA in Education and Theater Arts from UCSC and Auckland University, NZ. Click on this photo for video of the FoodWhat crew accepting this significant award and to hear Doron’s remarks. Click on this photo to hear Uriel’s words from the heart. 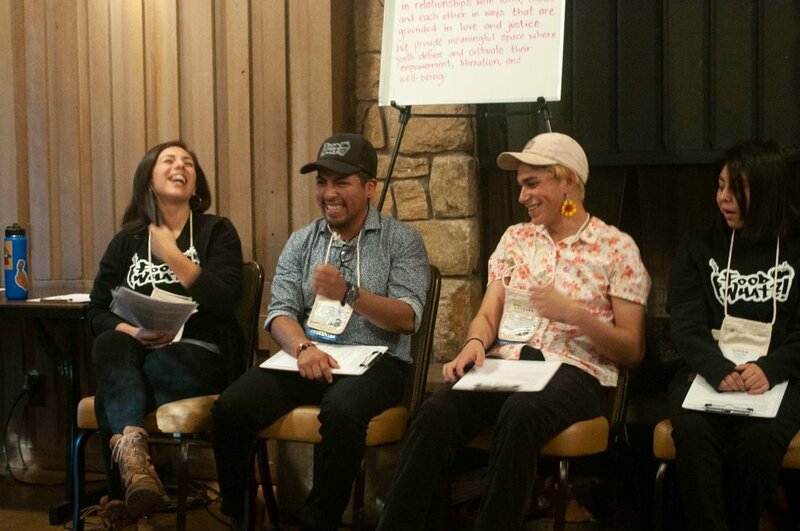 Irene, Uriel, Migé and Eustolia leading a workshop at the EcoFarm Conference on youth agency, empowerment and wellness. January: Warmest Wishes for a Healthy and Inspiring 2019! Irene, Puiyee, Uriel, Mary, Doron, Moriah, Kayla, Bruno (and Karakol)! 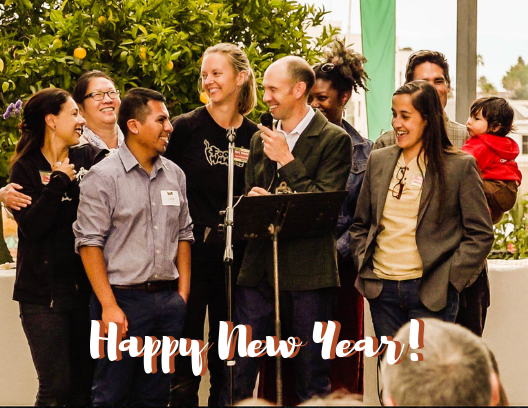 FoodWhat honored to receive the 2018 Santa Cruz Community Farmers' Markets Partnership Award. "In recognition of your contributions to the regional agricultural community, the youth of Santa Cruz County and justice work at large, we offer you this award. The Farmers' Markets and FoodWhat?! first partnered in 2012, employing local youth in food systems positions and supporting them in their personal and professional development. Today we acknowledge and celebrate the transformation that takes place for youth in your programs. The graduates we hire from FoodWhat?! are wise beyond their age and demonstrate a unique focus on teamwork, honesty, kindness, connection and generosity. By listening to youth and integrating their ideas and experience, your programs stay relevant and addresses substantial inequities in our communities. Such reflection and accountability are rare." Last week we held our "GivingThanks" dinner with this year's crew. After an incredibly delicious and wholesome meal, we went around the long table with each of us offering what we're grateful for. One alumni shared "I'm thankful for this food and that I have a place to come back to no matter how long it's been." May you always have a safe, meaningful, and nourishing place to turn to in your life and in this time. Doron, Kayla, Moriah, Irene, Bruno, Mary, Uriel, Puiyee and the FoodWhat Crew! Something really awesome happened this morning. FoodWhat hosted our annual Harvest Festival for a few hundred countywide students as we do each fall. We always set up a strong set of experiential, educational, and food-based stations for participants to dive into after they get to harvest pumpkins. This year, a number of youth spotted the UCSC Farm flowers in the field behind our event and went over to harvest a few to make bouquets. The UCSC folks gave us the green light and FoodWhat staff started inviting youth to go make bouquets if they'd like. While they were harvesting flowers (and making some strikingly gorgeous bouquets), some started picking leaves of spinach or digging up carrots to eat on the spot. Then a group of youth headed to the FoodWhat field and began harvesting our abundance of tomatoes, hot peppers, sweet peppers, more pumpkins...so we invited all participants and teachers to do so. These young people and educators connected organically, on their own terms, and with great joy, in pulling bounty, beauty and nourishment right out of the soil...and on the heels of yesterday's momentous sugar rush. None of this was planned. It was really something to see youth boarding their busses with armfuls of flowers and backpacks filled with veggies that they just harvested. The FoodWhat Summer Job Training Program is when youth dive into critical job training, build deep and supportive community, radically change their diet, and push into their strongest selves. All this growth and change happens through the most basic of human needs--food! We start off two mornings each week of the Summer Job with a game. Whether new ones, or classics like Capture the Flag, we begin each day this way not only to wake up and build community, but also to allow the youth who have had to take on adult responsibilities the opportunity to steep in the joy of play! Junior Staff Aurelio dishing up lunch with Guest Chef Martin Madriz from The Green Waffle! 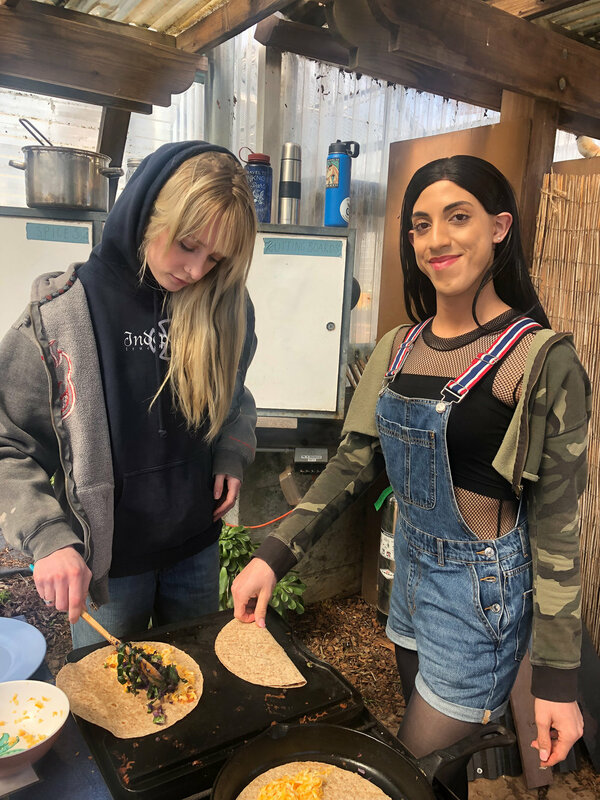 Each week, half the crew got to work with professional chefs from Watsonville to Santa Cruz to make an outstanding lunch for the other half of the crew. Repping Santa Cruz County and the FoodWhat Crew at our regional youth empowerment and food justice summit in July! Harvesting the bounty. Pride in work. Nourishing selves, family, and community. Who said hard hard work can't be full of laughter and smiles? Aurelio offering heartfelt gratitude to Programs Manager, Irene, for her immense support and contributions to his journey of growth and discovery of self. When the end of the Summer Job arrived, we celebrated the way we know best--by making a delicious dinner for over 100 friends and families of the youth who successfully completed this big endeavor. The night was filled with sharing appreciations for each other and all who made the Summer Program what it was. Each week this summer, every youth in the Summer Job harvested a big bountiful share of produce they have been growing all season to take home and share with their family. 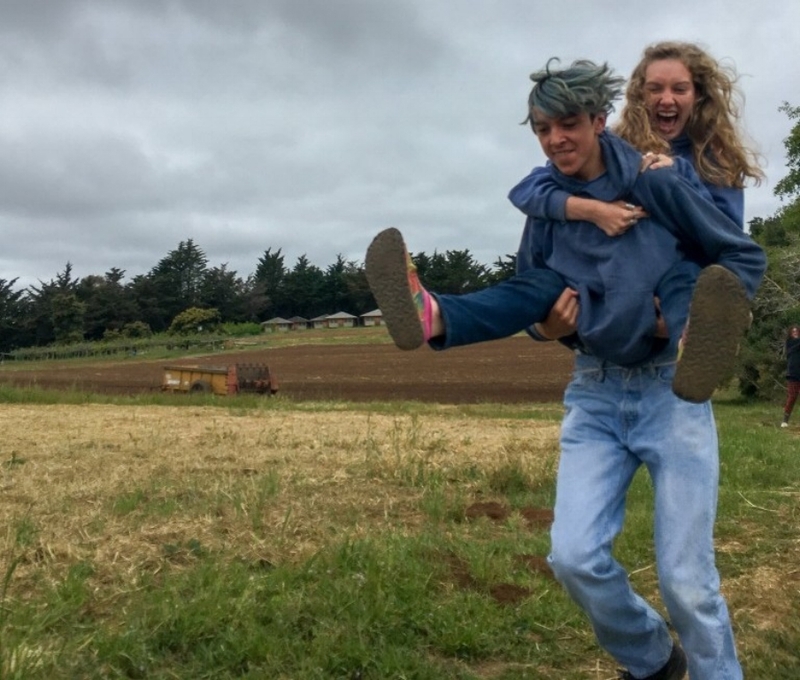 One way youth connect the radical diet change they experience on the farm into the rest of their lives. Pure Joy at the FoodWhat Farm Olympics! One week left of voting at New Leaf Community Markets to select the next round of nonprofits to receive benefits from their Envirotoken Program. Visit your local New Leaf and cast your vote for FoodWhat today! Whenever you bring your own grocery bag at New Leaf, you’ll receive a 10¢ Envirotoken, which you can donate to one of six local nonprofits. Each month, they tally up the tokens, convert them into cash, and present them to the beneficiaries. FoodWhat is currently an Envirotoken option in the Downtown, Westside, and Capitola storesAND in the running to be in the next group of recipients! "My favorite memory at FoodWhat would have to be when we made stone soup, because I feel like that dish itself brings people together and I remember that day that everybody was in the kitchen doing something. Even though Kevin said he hadn't washed his hands and it grossed me out, the soup was still good." "My favorite memory was creating the beds of soil out on the land and eating those sweet, juicy red strawberries." Youth responses to the question "How would you explain FoodWhat to a friend?" High Five to that! We're excited to continue to work with many of these youth in our Summer Job Training Program which just started this week! FoodWhat staff Kayla, Bruno, Irene and Moriah showing up strong at Greenlining Institute's 25th Annual Summit for Economic Justice in Oakland! 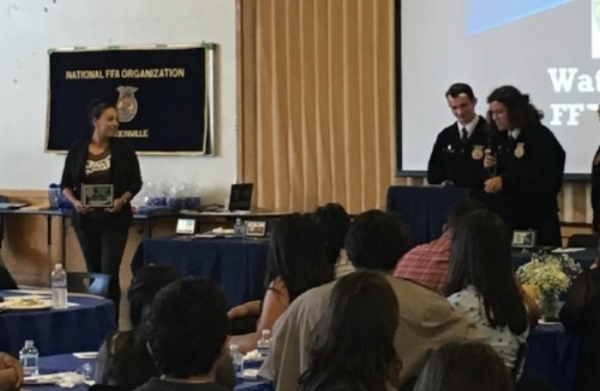 Programs Manager Irene Juarez O'Connell accepting an award on behalf of FoodWhat from the Watsonville Chapter of the Future Farmers of America at their awards banquet at Watsonville High School last month. FoodWhat Event Planner and Community Educator, Mason Franco, just received a 2018 Queer Youth Leadership Award (QYLA)! Mason won this award for their work at the intersection of gender and food justice. The QYLA is a one-of-a-kind event and significant recognition of four powerful and change-making countywide youth leaders. Mason gave a moving and inspiring speech to the packed crowd at the award night. "Food is what gives our bodies the nutrients to live another day. Thank you for all who have given their heart through food, and I will continue to do the same. " Q: Food What?! is what you're known for. Tell me about your work there. A: I did a summer job (there) and it changed my life. I went to conferences all over and got inspired to get more involved with food justice work. Now I’ve done workshops all over the county teaching about nutrition and the fast food industry and how messed up that is. Junior Staff and Event Planners Going Strong! Junior Staff = superstar youth who went through FoodWhat's Spring, Summer, and Fall programming last year and are now coming back in peer-to-peer leadership roles with the new crew. It is our great pleasure to introduce you to (above, left to right) Evelyn, Ozzy, Eustolia, Iris and Aurelio! 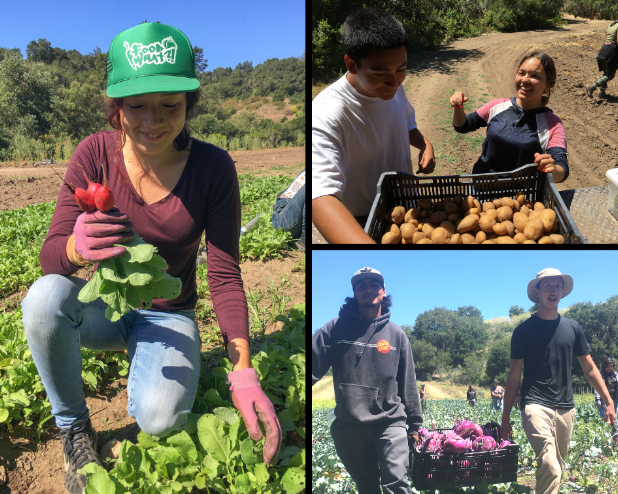 In 4 short weeks, FoodWhat will be hosting 300 middle and high schoolers from across the county to our Santa Cruz Farm for a jam packed day filled with youth-led workshops on nutrition and food justice, partner stations on everything from hydration to going to college, and hands-on activities from harvesting to bike powered smoothies to making pies. This inspiring and educational day revolves around the red, ripe, delicious strawberry. 2017 alums, Mason, Isabel, and Abi are leading the charge of every aspect of planning and implementing this big day! march: "I don't like kale at all, but this is good!" Just launched our 2018 Spring Internship with 5 crews of super energized youth from South and North County schools! Chef Zhane (top left) shared as part of her "triumph" at the end of the day: "I don't like kale at all, but this is good!" We had a strong start of programming for this year with an impressive collection of young folks. They got their hands dirty on the farm, made tasty food with each other, got to know the place, and collectively set the tone for the next few months. As we look forward to working with them this season, we look forward to sharing with you, so stay tuned! Check out previous years' POTM below!